Summer is here and that means it's time for an ice cream! I love my own ice cream and that is the Blackberry Chocolate Chip Ice Cream. Blackberry is one of my favorite fruits of all time. I have Blackberry shoemakers, Blackberry cakes, Blackberry soft drinks, Blackberry shakes and now I'm experimenting with Blackberry Barbecue Sauce. This fruit is a staple in our house, like tomato sauce, so we usually never go out. In high season, I buy them fresh, but in low season, I buy frozen because they are just as good. 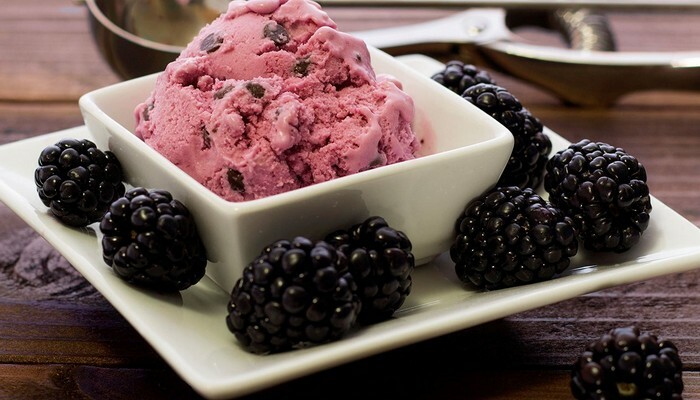 To make this Blackberry Chocolate Chip ice cream, you buy your berries to make a delicious blackberry syrup. With a sieve you press the pulp so that only this beautiful violet liquid remains. Once you have emptied your berries, you must make your egg pudding. Well, what you need to understand is that this step cannot and should not be accelerated. When you start for the first time, everything is very fluid. You keep cooking until it becomes thicker. It must be thick enough to be able to trace if you run your finger over the back of the spoon. Once both mixtures have cooled, pour the blackberry sauce into the egg-cream mixture and place in the refrigerator for about 3 hours to cool. Once the mixture is cold, pour it into the ice mixture. You want the machine to work for about 35 minutes. Find an even surface and place your old-fashioned ice cream mix. Let the ice maker work for 30-40 minutes with the mixture of salt and ice. When the ice has drunk for about 30 minutes, add the pieces of chocolate and switch on for another 10 minutes, or until it is so thick that the machine is switched off. 1. Combine the blackberries, 1/4 cup sugar and the lemon juice in a pan. Cook over low heat until the blackberries are cracked and syrupy, about 20 minutes. 2. Pour the mixture into a container through a fine-mesh sieve. Remove as much dark purple liquid as possible with a spoon and set aside to cool. Throw away the blackberry pulp and the seeds. 3. Heat half and half and the rest 1 cup of sugar in a saucepan over medium heat. 4. Beat the egg yolks with a whisk until they are pale and thick. Temper the eggs by pouring a small amount of the warm cream into the yolk while constantly beating. Add the hardened egg yolks to the pan with gentle stirring. Cook over medium heat with stirring for about 5 minutes. 5. Pour the thick cream into the bowl with the berries and pour the pudding and stir to combine. Cook this mixture until it cools. 6. Take your old ice cream maker and use rock salt and ice cream mix to get everything in layers. 7. Pour your ice cream into the machine and let it run for about 30-40 minutes. 8. Cut the chocolate into pieces and stir in the ice. 9. Serve immediately or in the freezer to harden even more. Meanwhile, add the cocoa powder to the whole milk and add another 40 ml of cream and heat over medium heat. Once warm (but not boiling) pour the egg mixture slowly with the mixer in the middle layer to dampen the egg. Meanwhile, prepare the blackberry syrup. Squeeze the blackberries into a blender. Strainer (must contain about 1 cup of juice). Put these in a jar with the extra 50 grams of sugar and vinegar. Prepare for half. Cool in the refrigerator until use. When you are ready to defeat, defeat the chocolate base in an ice cream machine according to the manufacturer's instructions. When the ice cream is ready, mix the chocolate pieces and cover with the blackberry syrup. Cover it well with plastic and place it in the freezer. Leave it for 10-15 minutes before serving and let it soften.